NIDA Launchpad invites Melbourne’s creative community to explore their artistic practice and undertake creative development at our NIDA Melbourne studios. Applications for Autumn-Winter 2019 will open in April 2019. What does NIDA Melbourne provide? Please call NIDA Melbourne Manager – Community and Participation on 03 8640 0241 or email guild@nida.edu.au to discuss your NIDA Launchpad application. 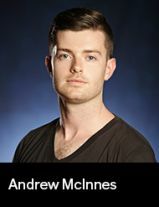 Andrewʼs work is entertaining, darkly comic, visual theatre, embracing heightened theatricality. He has been active in traditional and experimental theatre in Sydney and Newcastle as a director, writer, movement director, and performer since 2008.